Visit with your advisor to ensure all graduation requirements have been / will be met and complete an application for graduation. Application for Graduation - Printable form [pdf]. Departments will submit applications to the Registrar's Office approximately two weeks after they are due to the advisor. An application should be submitted for the term when all degree requirements will be met. Any "Incomplete" grades must be resolved prior to the posting of your degree. MSU will not post a degree when an "I" or an "X" is present or a grade is not recorded. If you owe money, have parking fines, outstanding library materials, etc. your account will be put on hold. As a result, your degree will not be posted. All financial obligations, loans, library books, equipment owed, fines, bills, etc. must be cleared prior to graduation. Diplomas, transcripts, and/or teacher certifications will not be provided until all obligations are met. Please make sure your account is clear prior to graduation. 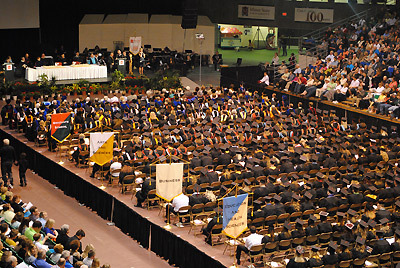 Check your MSU email for frequent graduation and commencement updates. Complete exit loan counseling before you graduate or leave school. If you have ever received a Federal Stafford Loan, Federal Perkins Loan, or a Federal Nursing Loan, you are required to complete loan exit counseling. This requirement may be completed online at www.minotstateu.edu/finaid/counseling.shtml. Contact Career Services at 701-858-3362 or 701-858-3360 for assistance with your job search and career development. Make arrangements to check out of MSU dorms or residence halls. Contact the Housing Office at 701-858-3363 with questions. If you are considering an advanced degree, please contact the MSU Graduate School at 701-858-3250 to discuss the various degree options. Keep in touch with other University alumni through the MSU Alumni Association at 1-800-777-0750 ext. 3234 or www.minotstateu.edu/alumni. Please contact the Registrar's Office at 701-858-3345 or 1-800-777-0750 ext. 3345 if you have any additional questions concerning the Commencement ceremony or graduation. * Please note: Minot State's toll free number is 1-800-777-0750 ext. XXXX. The extension to the office is the last 4 digits of the local telephone number.